Flipboard and Facebook are two platforms, if not apps, that don’t need any introduction. While Facebook has been around for more than a while and has a far larger footprint in the digital world than anything else, Flipboard debuted on iOS and redefined the concept of a social news reader, expanding later on into Android and other popular platforms. Now, it seems that both of these are officially making way into the Windows 8 sphere as well, where both the apps were showcased today at BUILD 2013, right beside the Windows 8.1 Preview download announcement. Windows 8’s biggest beef has always been the lack of apps, where iOS and Android overshadow the competition by a large margin. The Windows Store is gradually growing, but it’s still not enough, and the addition of two large apps such as Facebook and Flipboard to the mix is definitely going to be a welcome step in the right direction. During the Windows 8.1 announcement, Steve Ballmer confirmed both the apps coming to the Windows 8 platform, and even showcased both of them on an 8-inch Acer tablet running Windows 8. The announcement is definitely huge, and a testament to the fact that Microsoft really wants its new Windows operating system version to be a success, for all smartphones, tablets and PCs. Sadly, though, there hasn’t been any ETA for when the two apps will become available. On its own part, Flipboard claims that its Windows 8 app is going to be the best ever that the company has done so far, and will complement the beauty and elegance of the Modern UI. Facebook, on the other hand, has been one of the largest social networks on the planet, and even the website receives billions of visitors every day, allowing millions of people to connect and interact with each other. The social networking giant already enjoys a massive following on smartphone platforms such as iOS and Android, and offers really polished apps for both, so we expect the Windows 8 variant to be top notch as well. According to Steve, the app will be an exciting way to enhance Facebook’s vision of connecting people (no pun intended towards Nokia), and we expect nothing short of that. 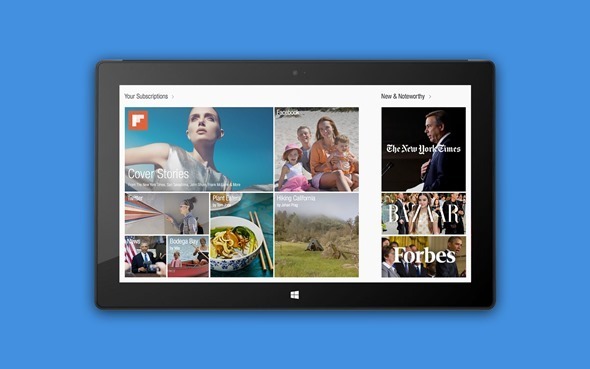 The announcement of official Facebook and Flipboard apps for Windows 8 is one step that shows how serious major developers are taking the new platform from the Redmond giant. It’s no hidden fact that the user base for Windows 8 is growing by the day, and if the one shortage of apps can be addressed for the platform, it can surely become a huge success.